COLUMNA MESSIANIC RESEARCH CENTER: When Christ Rules This Planet Earth For 1,000 Years, WHAT KIND OF TECHNOLOGIES AND TECHNICAL MANAGEMENT WILL HE IMPLEMENTS? Those Who Want To Reign With Christ Must Know, and Prepare Now! When Christ Rules This Planet Earth For 1,000 Years, WHAT KIND OF TECHNOLOGIES AND TECHNICAL MANAGEMENT WILL HE IMPLEMENTS? Those Who Want To Reign With Christ Must Know, and Prepare Now! As a taste and example of the Messianic Technologies that the KING of Kings (Christ) will implement when He rules this world, Engr. LOPE COLUMNA took the opportunity to introduce the concept of MAINTENANCE EXCELLENCE via PROACTIVE MAINTENANCE vis-a-vis the expensive and destructive concept of PREVENTIVE MAINTENANCE. This took place when he was invited to speak at the 3rd MANILA Technology Conference & Technopreneurship For Nation Building. 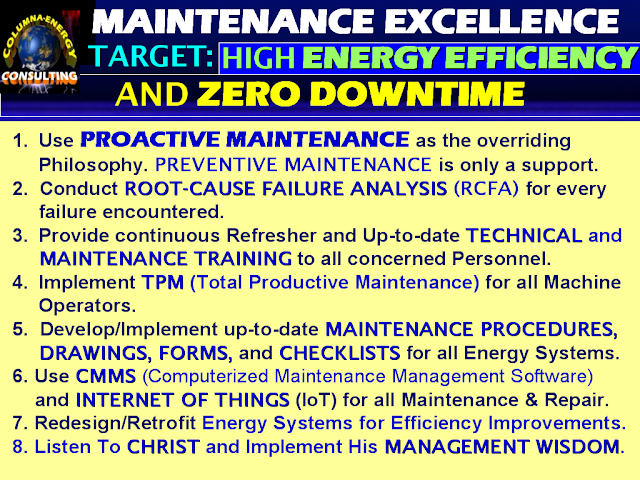 This MAINTENANCE EXCELLENCE Methodology will be applied in the Maintenance Management of Planet Earth and the entire Universe. Every Corporation and Person who apply it today will reap many Blessings. Many People, Engineers, Corporate Executives & Managers, think that today's Science & Technologies will be no more when Christ returns. This proves that really the whole world is deceived (Revelation 12:9). The TRUTH is today's Technologies and Engineering, which started Industrial Revolution and used in advanced Military Weapons, will be used by Christ when He rules the Whole World (Isaiah 2:4, Micah 4:3). Thus, last March 23, 2017, Engr. 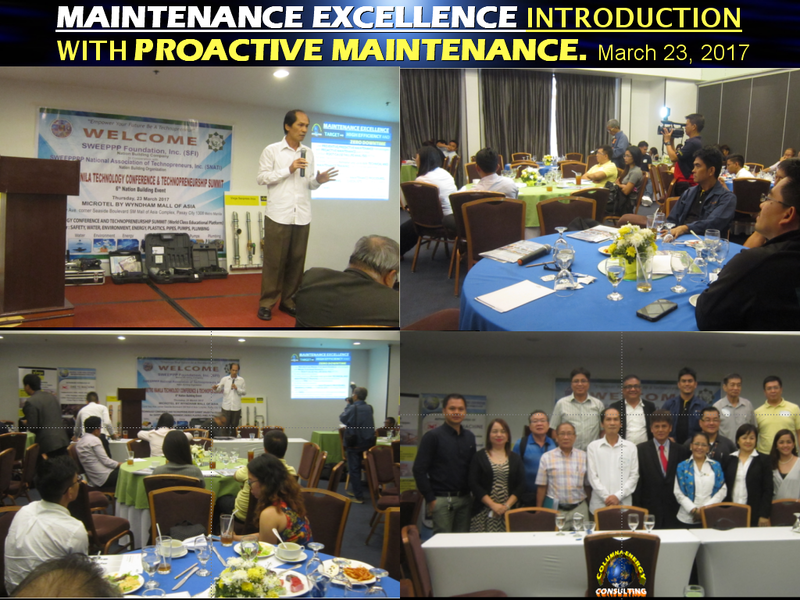 LOPE COLUMNA presented his concept of MAINTENANCE EXCELLENCE with PROACTIVE MAINTENANCE (Contamination Control) as the overriding Maintenance Management Philosophy of Christ's reign. This is via the invitation of the SWEEPPP Foundation to speak at their TECHNOPRENEURSHIP Summit for Nation Building. The venue was at the Microtel Hotel in the Mall of Asia (MOA) complex. Attendance were representatives from the Philippines' Department of Science & Technology (DOST), Professional Regulations Commission (PRC), TESDA, Non-Government Organizations (NGO's), Companies from China, Other Countries, etc. 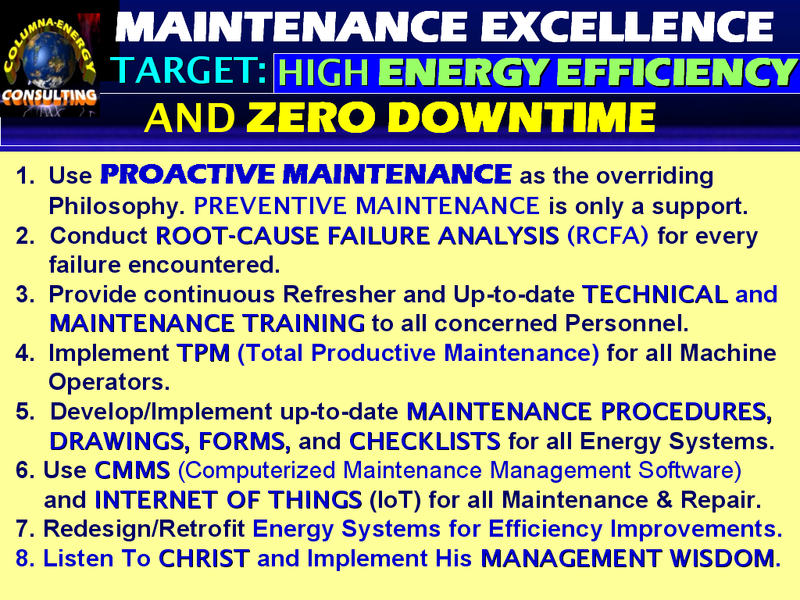 In this presentation, I explained the FOLLY OF PREVENTIVE MAINTENANCE Management as it is applied today in the majority of Buildings, Factories, Vehicles, Power Plants, etc. PREVENTIVE MAINTENANCE is reactive and it requires people to do maintenance based on the machine's running hours or days, NOT on the actual condition of the machine, In other words, you have to replace oil, bearings, parts, etc. whether they are still good or not. As a result of this WRONG Maintenance Philosophy, the prices of Electricity and Production Cost increase => Increasing the prices of Prime Commodities. For example, Electricity price increased because of the PREVENTIVE MAINTENANCE (PM) of the Malampaya Natural Gas Plant, as well as, the PM of Power Plants that even causes Brownouts & Blackouts. This wrong Preventive Maintenance Management and implementation is also a major cause of CLIMATE CHANGE Disasters and other environmental pollution. And, if we include the regular breakdowns of the MRT due to the wrong Preventive Maintenance (disrupting Millions of Passengers), everyone's head should shake to admit that there is really something WRONG in today's Preventive Maintenance Management. 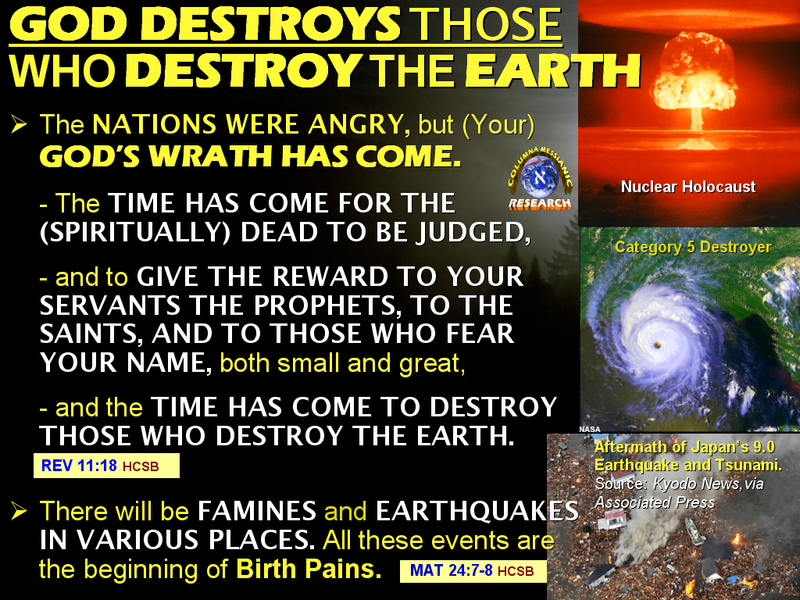 WARNING: GOD WILL DESTROY ALL THOSE THAT DESTROY HIS EARTH! 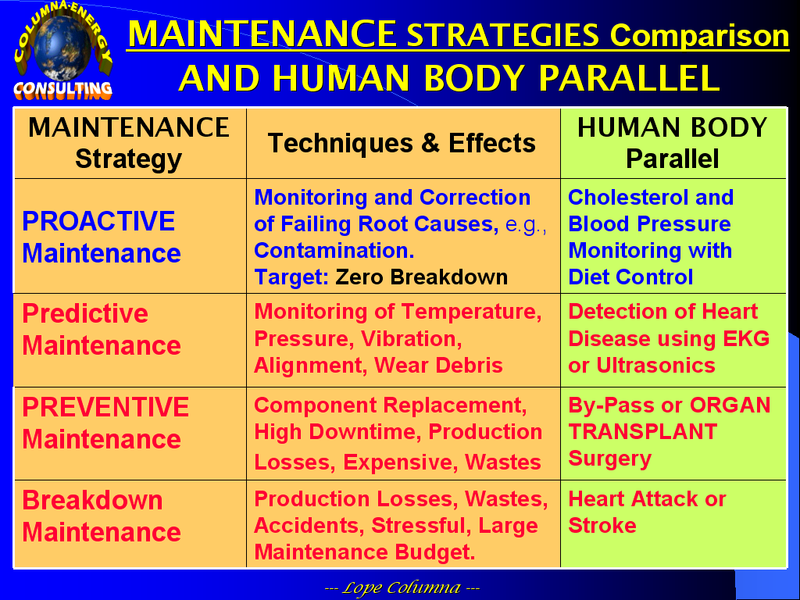 PREVENTIVE MAINTENANCE, if allowed to dominate in Maintenance Management, is a misnomer and deception. This is because Preventive Maintenance is NOT PREVENTIVE; In other words, it does not prevent Failures! 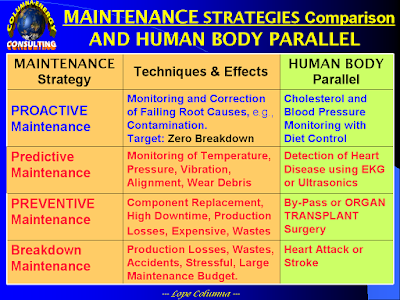 In fact, Preventive Maintenance causes Machine Failures => Destroying People, Businesses, and the Whole Planet Earth. 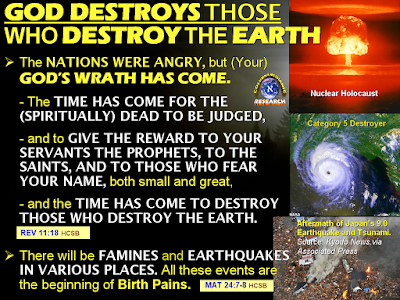 This is a warning to everyone: God will destroy all those that destroy the Earth (Revelation 11:18)! These destructive and deadly effects proved that Preventive Maintenance is a mixture of Good & Evil coming from the TREE OF KNOWLEDGE of GOOD & EVIL. Therefore, in the reign of Christ, PROACTIVE MAINTENANCE, which is from the TREE OF LIFE, will be the dominating Maintenance Management Philosophy. The GOOD in the Preventive Maintenance can be used, but the EVIL in it will be totally under control. In other words, Preventive Maintenance can still be used; but, only in the subordinate capacity and in a non-invasive maintenance. Corporations and their Maintenance People should OVERHAUL FIRST their Mindsets before overhauling their Machines. They should make PROACTIVE MAINTENANCE as their dominating Maintenance Management Philosophy. After the presentation, several attendees from the audience approached me for invitation to speak in their respective organizations; also requesting for my calling card, e-mail address, and cellphone number. Good PM, Engr. Si Mark po to ng tnx plumbing. Naka kinig po ako sa talk nyo about energy efficiency. Salamat po, madami ako na tutunan. From the Group: LUMAPIT KA SA DIYOS! Jhune Bosogan Y Abellon When Christ will come and rule the world, there are no technology anymore.. Because the earth is going to be destroyed..
Lope Columna II You have to erase that DARK falsehood from your belief system, Mr. Jhune Bosogan Y Abellon. Otherwise, you will be thrown into outer darkness. This is because you contradicted the Scriptures of Isaiah 2:4 and Micah 4:3. I visit day-to-day some web pages and blogs to read articles or reviews, however this blog offers quality based writing. subject but generally people don't discuss such subjects. updated with coming near near post. Thanks 1,000,000 and please carry on the rewarding work.